Consolidate IT Resources and Virtualize to save cost. Fail-resilient, High performance iSCSI NAS Storage system from 3TB to 180TB. Rx400 and Rx500 NAS series are ideal Enterprise NAS storage solutions providing blazing performance, high data availability, maximum user productivity and storage reliability utilizing it’s excellent and high quality component resources. 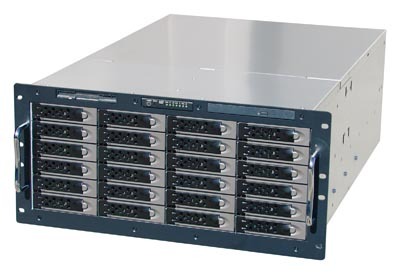 Its hot-swappable, front-loading, disk drives and RAID 5, 1, 0 + hot spare capabilities, as well as dual iSCSI ports, and dual or Quad Gigabit Ethernet network interface with load balancing and failover capabilities ensures fast data protection and recovery. VERITAS Backup Exec 9 and Storage Replicator are bundled as options software for real-time backup and restore, data replication. Local and Remote tape or disk-to-disk (D2D) backup software, Server-to-Server (S2S) Synchronization software for automatic Windows client backup, plus network backup agent support, makes backup and recovery, mirroring and cloning a Snap. The RX series affords seamless integration by providing simultaneous support for mixed operating system platforms, including Windows, Linux, Sun SPARC Solaris, HP-UX, Macintosh and Unix environments, as well as HTTP and FTP, SNMP protocol support, and support for Microsoft Active Directory Service (ADS), UNIX Network Information Service (NIS), and SNMP environmental monitoring tools. Retail Price: Low Price starts from $3,795.